I don’t have seasonal allergies, but I feel for people who do. It can’t be fun feeling for months on end each and every year! 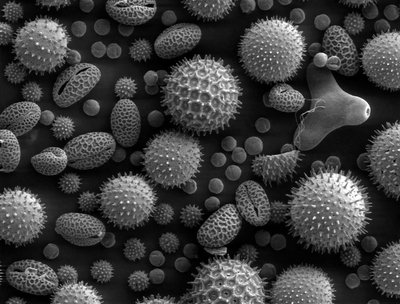 Still, you might enjoy this scanning electron micrograph of pollens. Posting the photo above was inspired by discovering this Colourised scanning electron micrograph of pollens (on the National Geographic website). 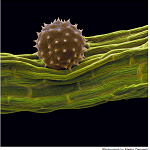 Some of the pollen grains look rather benign, others, well, I can see why they make you sneeze. You can see an example of the pollen from an indian mallow plan to the left. See this image and others at much higher resolution using the link above. Next post: Buy Food You Can Eat On-Line!